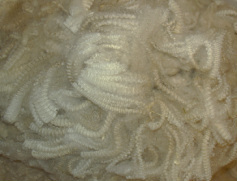 Finnsheep wool is very unique among other Northern European short-tailed breeds. It is medium-fine to medium in class, single coated, ranges from 21.5 to 31 microns and possesses a very well-defined crimp. Its luster is comparable to that usually found only in longwools. Finnsheep wool comes in a wide array of colors and patterns. The IFR has adopted an expanded version of the Finnsheep Color and Pattern Guidelines that are used by the Finnsheep Breeders Association of Finland. There are five main "colors" of Finnsheep: Musta/Black, Ruskea/Brown, Valkoinen/White, Harma/Gray and Vaalenruskea/Fawn. Of these, Valkoinen, Harma and Vaalenruskea occur as a direct result of Agouti locus (A locus) alleles acting on the Base color (B locus) alleles. In August of 2013, the IFR released its updated guide to colors, patterns and markings of the Finnsheep breed. The guide is available at no cost to IFR members. The IFR CPM Guide contains the most current information regarding colors, patterns and markings found within the Finnsheep Breed. A very special thank you to all of our consultants and members who worked together to make this guide as complete, accurate and understandable as possible. Coding: (Bb/Bb) This sheep will always pass a brown color allele to its lambs. Coding: (B+/B+) This sheep will always pass a black color allele to its lambs. MUSTA/BLACK: Colors range from dark, non-fading black to red-tipped faded black. 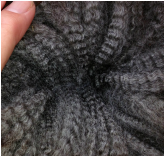 Photos show a medium black ewe, a deeper black raw fleece and medium black processed roving. Animals expressing the black color may carry two black color genes or one black and one brown color gene. Coding: (B+/Bb). 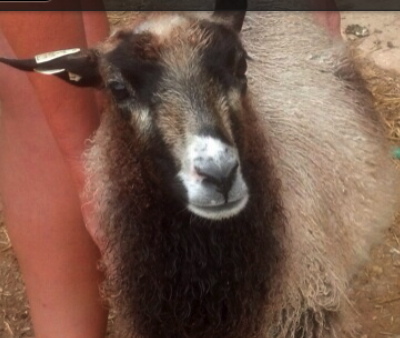 Sheep appears black but carries a brown allele as well. This sheep can produce black or brown lambs depending on which color allele is passed to its offspring and the allelic configuration of the animal it is crossed with. Like the base color, each lamb has two patterning alleles, one inherited from each parent. These alleles are found at the Agouti locus (A locus) of the DNA chain. These alleles work by turning off or modifying the production of eumelanin and pheomelanin pigments in the wool follicles and skin. If there is no patterning instruction at A locus, the sheep will appear base color. The lack of patterning instruction is indicated as Aa/Aa. It is important to note, that the two alleles always express and this can affect the visual appearance of the second allele. When determining patterning alleles, it is very important to train your eye to look for the degree and location of white/light display. The more dominant patterns have a higher degree of white/light display. Lambs are best identified within the first 21 days of age. Coding: Awt - White is the most dominant of the patterning alleles. Valkoinen/White: This "color" is actually a pattern. Genes have completely turned off the production of eumelanin in the wool follicles. Note that the ewe to the left is pink skinned and the ewe to the right is black skinned. This illustrates the variation of eumelanin production that can be genetically controlled. Black skinned, white patterned sheep are less prone to sunburn than their pink-skinned counterparts. Coding: Ab - This pattern is very white/light. The only pattern display that has more white/light display is Valkoinen/White. These sheep are very bright. A full description of this pattern and its identifiers is available in the IFR Color, Pattern and Marking Guide (CPM Guide). This pattern has been confirmed in Finland. Harma/Gray - Harma/Gray is often understood as a color but it is actually the result of various alleles expressing along with the base color. The shade of Harma/Gray produced can be accurately determined by understanding the affects of the five factors of color. Once these factors are understood, a particular shade of color can be reliably reproduced. Coding: Ag- The sheep is born base color with Ag indicators showing. Ag lambs get lighter with age. White/light display is inside the ear, over the bridge of the nose and on the front and rear flank areas. Eye rings and "sugar" lips and/or nose are present. The udder or testicular area will be light. Coding: Alg - Light Gray. Lambs have white/light display on the belly area. The pattern mutes with increasing amounts of dark present as it moves up over the rib/side area and to the shoulder. The shoulder area remains dark. Eye rings and sugar lips may or may not be present. Photo one shows a one week old Alg lamb. He is proposed to be Alg/Albl. The second photo is a ewe lamb known to be Alg/Aa. Photo three shows three different shades of harma/gray that can be produced by combining patterning alleles. The light gray lamb is an Alg carrier. Photos courtesy: Ost Ridge and Trimburfield Farm. Coding: Agg - Often referred to as Gotland Gray, this pattern is very unique in its expression. The lamb is born its base color and will show no signs of light pattern display that are usually associated with Harma/Gray unless it is carrying a second allele for either Ag or Alg. When the lamb is between one and two months of age, its wool will suddenly reveal a complete change from base color to harma/gray. This is the only Harma/Gray pattern known to express this way. Because this expression is so unique, questions continue to be asked regarding its actual control mechanisms. The IFR will continue to update its information as new information is learned. This allele was formerly referenced by the IFR as Dilute B. Photo One shows an Agg lamb fleece. There is a very definite point in change over. The Agg lamb on the right shows no hint of the coming change. She appears to be B+/B+, Aa/Aa. Time has proven that she is B+/B+, Agg/Aa. Sininen/Blue - Sininen/Blue, like Harma/Gray, represents a group of A locus patterning alleles that can cause a fleece to have a blue tone to its visual representation. This is true of the musta/black based fleece, however a ruskea/brown based fleece may have a lilac tone. Sheep that carry patterning alleles for any of the Sininen/Blue patterns have a light pattern expression that is darker than that seen in badger face patterns. Coding: Albl (Light Blue) - Albl sheep have dark ears that are rimmed with light display. Light teardrops or smudges are often seen below the eye just outside the area of pattern avoidance. A light nose ring that joins with the forehead display is present. The darkness of the ventral portion extend through the hind legs and up towards the tail area. There is a strong area of pattern avoidance at the rear thigh and the top of the neck behind the ears. For a complete description of Albl, refer to the IFR CPM Guide. Photos below courtesy: Trimburfield Farm, Woodspryte Farm and Morgan-Tenney Farms. Coding: Abl (Blue) - This blue pattern is darker than Light Blue (Albl). A nose ring, or partial nose ring is present. The ears are dark and may be rimmed or partially rimmed with light pattern display. Tear drops can be seen below or just off the eye ducts. The light display is more limited than Albl. Refer to the IFR CPM Guide for complete description. The photo on the left shows an adult Abl/Aa (proposed), the photo on the right shows an adult Abl/Alg (proposed). Coding: Aeb (English Blue) - This is the darkest of the blue patterns. Light pattern display is very minimal. Small tear drops are present close to the eye. A minimal or partial moustache may be present just above the upper lip. The outer ear is tightly and finely rimmed. Slight dappling can be noticed behind the shoulder and across the loin areas. Swiss Markings: Asm - This pattern is very dark. Light pattern display can be seen on the upper and lower lips, extending up either side of the nose bridge, over the eye area and on to connect with the ear. The ear is outlined on the outside and the inner ear may show some light pattern display closer to the head that darkens as you look towards the outer edge. A narrow neck collar (does not join at the back of the neck) is present. Very light "frosting" is present in the ventral areas. Minimal smudge markings are present on the thigh areas. Additional photos of Asm, including a clear facial photo, are available in the IFR CPM Guide. This lamb is proposed to be Asm/Albl. His markings are challenging to separate. The Asm has significantly darkened the fleece which is a deep blue gray that does not fade or lighten. This is the dark fleece of the lamb on the left. By understanding which patterns create a specific shade of fleece, the color can be reliably reproduced. The DNA chain can also contain instructions for NO patterning at A locus. This is indicated as Aa/Aa. The Aa/Aa sheep will fully express it base color (B locus). There are other factors that affect the "color" of our sheep. These are Fading (fa), Silvering (Si) and Dilution (Di). To better understand these processes, the role of the pigment cell (melanocyte) must be understood. Melanocytes manufacture melanin (pigment). The melanin can be in one of two basic forms: eumelanin or phaeomelanin. Once produced, the melanins are then transported into the hair or wool shaft giving them color. The shade or intensity of color is determined by how efficient the processes of melanin production and transport into the cell are. Efficiency of melanin production and transport tends to run in families, most especially maternal lines. This fact should be taken into consideration when developing specific colors/shades of wool. Fading, Silvering and Dilution all represent melanin loss due to inefficiencies in production and/or transport of melanin, however, the time period for each is significantly different. Fading is a gradual loss of melanin, Silvering is a limited loss and dilution is a rapid loss. Full descriptions and photos of Fading, Silvering and Dilution within the Finnsheep breed are in the IFR CPM Guide. Finnsheep are also known to carry genetics for spotting (S locus). Since spotting is caused by a lack of melanoctes in a genetically-defined area, animals carrying for spotting can be easily identified. A spotted animall carrying the Awt pattern allele can also be identified by looking at its hoof horn, nose and lips. Awt animals that show white hoof horn, pink noses and/or lips are carrying genetics for spots. The IFR uses the Finnish system for identifying Spotting patterns in Finnsheep. This system, along with complete photos and descriptions of spotting is located in the guide mentioned above. The final factor that can affect the visual appearance of the sheep is the Extension gene (E Locus). The E Locus is located on chromosome 14 and it visually affects the expression of the A Locus pattern alleles (located on chromosome 13). There are two alleles at E Locus: Ed (dominant) and E+ (wild). E+ allows the A locus patterns to be visually expressed, Ed does not. Full information regarding Extension genetics and how they work is located in the CPM Guide. To learn more about Finnsheep or Finnsheep genetics, please contact the International Finnsheep Registry. We would be happy to assist you!